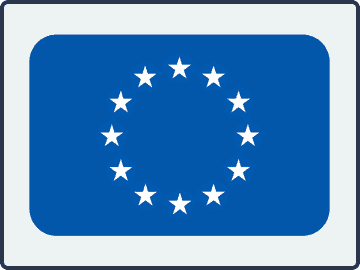 Since the early 2000s, European countries have individually regulated the online gambling industry while also dealing with the ramifications of these regulations under the European Commission. Europe is interesting geographically because it holds a lot of individual countries and a relatively high population inside of a relatively small amount of land mass. This has led to tremendous, complicated trade agreements and other ties throughout history, which in turn has ultimately culminated in the creation and maintenance of the European Commission and work towards the European Union. For the online gambling industry, this has meant a lot of changes since the early 2000s as most individual countries in the EU have set up their own regulatory bodies. European players, and even players from outside of the European Union, have plenty of options when it comes to picking the sites that they would like to play with. This creates a lot of competition, and that competition means that players are the ones who ultimately benefit as there’s an upper pressure to do more and more to make the experience better and better. Make sure that they have the banking options you want. There are tons of regional and local payment methods that are accepted at some European online casinos and not others. If you use some of these, you’ll need to verify that the site you’re considering accepts them. Take a look at the promotions available. The respective tax rates in different countries sometimes end up being passed along to the players in the form of worse bonuses and other deals. Comparing bonus and promotional opportunities is a big part of deciding where to play if you’re focused on getting the best value. Check out the availability of the customer service and support teams. Many EU casino sites will only have support during certain business hours, but others will have customer service representatives available 24/7/365. This is particularly important if you play at off-peak hours. Because there are so many solid options to pick from, players in Europe and those from outside of Europe who want to play with online EU casinos can be a bit picky and shop around a lot for the option that will fit them the best as individuals. One of the problems that has plagued the online casino world since it first emerged in the mid-late 1990s is that there are no international guidelines as to how they have to be regulated. As a result, each individual country that has regulated the industry within their borders has requirements, rules and policies that are a bit different from each other. When you add in the fact that a significant percentage of the people who originally make these rules haven’t had the most experience with gambling online in any form or fashion, then you get the recipe for some weird situations. Now imagine that you put several of these countries in the same area and players from one country are trying to play at casinos from other countries. It’s not difficult to see how it can turn into a serious mess in some situations. What we want to do here is break down the general ideas behind the types of things that you might encounter along these lines in case you run into something that you don’t understand or that doesn’t quite make sense to you. There are different degrees of restrictions that these jurisdictions can have for which players can play with their casinos and where players in their country can play. You’ll see different combinations of various options with this, and it’s not always completely intuitive as to which options you’ll have with any given country. Generally speaking, most countries will allow players from other European countries to play with sites their regulatory bodies have issued licenses to, but this isn’t always the case. Others require that only players from inside their borders are able to play at those casinos. For the most part, most countries with regulatory bodies for online casinos in the EU will have rules that their players can only play with sites that they have licensed themselves. This makes sense as it’s a source of revenue, but it can lead to some stifled competition and difficulties in enforcement. Some licensing bodies will set up blacklists on the ISP level to try to keep players from accessing gambling sites that aren’t regulated by their particular licensing board. Others will have laws against playing with outside, unlicensed sites without any means for enforcement. A few have no real regulations whatsoever on where their players can enjoy their favorite casino games, so it really just depends on where you’re located. Effective blacklists that are updated constantly are the least common, and you can probably count on one hand the number of these that exist in the world total, let alone in the EU. Blacklists that are updated between two and six times each year are really easy to get around with re-directs that the sites themselves will typically set up, maintain and keep up-to-date. With blacklists that are set once and then left alone or updated annually, the money and resources that go into keeping the list alive are basically like setting money on fire. This type of list is so ineffective that it’s mostly as if it’s not even there. If you are located somewhere with a blacklist, and you aren’t satisfied with your options for licensed casinos within your country, then you do have the option to play with foreign casinos that are not licensed there. You’ll want to check to see about the legalities of doing so, but it’s completely legal in several European countries with no problem. Some games are set up that they require lots of players to have an effective setting. Poker is one of those that comes to mind, but others like live dealer games, bingo and anything with a chat function can work along similar lines. If a site accept players from inside of one country instead of from several places all over the world, you can run into problems that come along with a small player pool. Poker is the place where this is seen the most, but in live dealer games that only allow players from a certain country, you’ll notice that the action in the chat function isn’t as lively. This can be an issue for bingo players in particular who love the social atmosphere and meeting people from across the globe who like playing the games as much as they do. There’s not an easy solution to this problem, but some jurisdictions have introduced changes that allow player pools from sites licensed by other regulatory bodies to become mixed. This helps the games and the overall experience, but it’s still often insufficient compared to a wide-open pool that accepts players from all over. Something really interesting that we’ve seen is the European Commission step in to enforce certain EU trade laws on the online casino front. Policies that keep players from accessing casino sites in the EU in other countries have been challenged, particularly from the blacklist side of things. When these things are challenged in court, they almost always get ruled in the favor of players having more open choices, but the individual gambling commissions and regulatory bodies often bicker about it, so compliance doesn’t always come right away. With that having been said, there have been a variety of other cases that have been tried over the whole thing in front of EU courts, so the interplay between the individual countries and the EU as a whole is important to keep in mind. The situation for the legalities of EU casinos online is a bit complicated. However, most players in these countries will have plenty of options to choose from, so you can afford to be particularly picky about where you decide to play. This is a major advantage for players who live in this part of the world.